A RUP LIFE: Quilts of Love | QUILTED BY CHRISTMAS – Book #REVIEW, Kindle Giveaway & “Merry Quilted” Facebook Party! This is my third Quilts of Love book and I have to say they keep getting better! I love Christmas themed books and Quilted by Christmas by Jodie Bailey was amazing! This was a adorable story about a couple that reunites after many years. They have a past they need to work through and they need to trust God and trust in His forgiveness if they can forgive one another. I loved the characters in this book. Justin and Taryn were both likeable. You found yourself routing for them both. I love when there are two strong awesome characters - it makes reading so pleasurable. Bailey really knows how to tell a story - she is new to me but I plan on looking at other books she has written because this one was so wonderful! Last of all the quilt part of the story is weaved in and was the centerpiece of the story. I loved that, too! You can purchase your copy of Quilted by Christmas at your local book retailer or online at stores like Amazon. 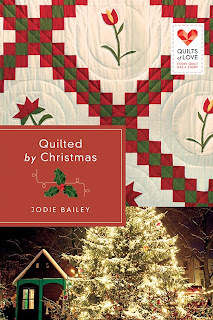 Don’t miss the newest Quilts of Love book, Quilted by Christmas by Jodie Bailey. This QOL release is a warm Christmas tale of God's steadfast love.